They include the first lesbian state delegate in Virginia and the first transgender elected official in Pennsylvania. 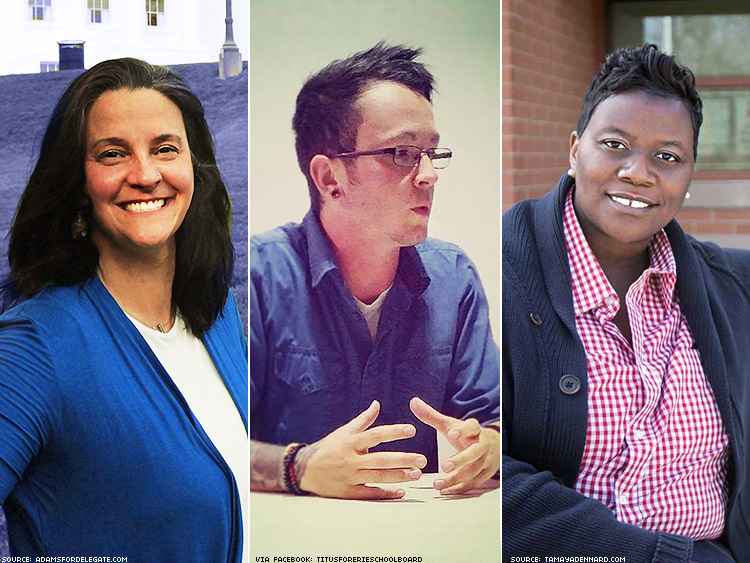 There have been even a few more historic LGBT victories coming out of Tuesday’s election. Virginia elected not only the first transgender member of its House of Delegates (Danica Roem), but the first lesbian member of the body, Dawn Adams (pictured, left). Adams, a nurse practitioner and health care activist, was elected in the 68th District, which includes the city of Richmond. A Democrat, she defeated incumbent Republican Manoli Loupassi in one of many Democratic pickups in the state. Also, Mark Levine, who is gay, was reelected to the House of Delegates. Tamaya Dennard (pictured, right), an African-American lesbian, was elected to the Cincinnati City Council, where she will join Chris Seelbach, a gay man who was reelected. She is an innovation specialist with Design Impact, a nonprofit social innovation design firm in Cincinnati. She’s a Democrat and Cincinnati native. Tyler Titus (pictured, center) became the first openly transgender elected official in Pennsylvania with his election to the Erie School Board. He works at Harborcreek Youth Services as the clinical therapist in the therapeutic foster care program. Ben Allatt, reelected to Harrisburg, Pa., City Council; Vernetta Alston, elected to Durham, N.C., City Council; Carol Becker, elected to Minneapolis Board of Estimate and Taxation; Mike Bonin, reelected to the Los Angeles City Council; Guyleen Castriotta, elected to the Broomfield, Colo., City Council; Richard Conti, reelected to the Albany, N.Y., Common Council; Dean Dafis, elected to the Maplewood, N.J., Township Committee; Zachary DeWolf, elected to the Seattle School Board; Paul Durham, elected to the Tucson City Council; Tim Eustace and Reed Gusciora, both reelected to the New Jersey State Assembly; Michael Fenton, reelected to the Springfield, Mass., City Council; Michael Gongora, reelected a Miami Beach Commissioner; Jeff Harris, elected to the Westwood, Kan., City Council; Corey Johnson, reelected to the New York City Council; Nick Komives, elected to the Toledo, Ohio, City Council; Lydia Lavelle, elected mayor of Carrboro, N.C.; LaWana Mayfield, reelected to the Charlotte, N.C., City Council; Matthew Miller, elected to the Newton, Mass., School Committee; Alex Morse, elected mayor of Holyoke, Mass. ; Nelson Roman, reelected to the Holyoke City Council; Denise Simmons, reelected to the Cambridge, Mass., City Council; Peter Spadafore, elected to the Lansing, Mich., City Council; Lawrence Webb, reelected to the Falls Church, Va., School Board; Chris Wharton, elected to the Salt Lake City Council; Patrick Wojahn, reelected mayor of College Park, Md. ; Karen Stegman, elected to the Chapel Hill, N.C., Town Council; Amy Zannelli, elected to the Lehigh County, Pa., Commission; and Ed Zipprich, reelected to the Red Bank, N.J., City Council.